Mushroom Model Publications (MMP) is based in the UK. They have all their books printed by their associate Stratus in Sandomierz, Poland in the English language. Stratus also does their own series of books in both English and Polish. This new book is soft-cover of 144 pages in 8 1/4" x 11 3/4" page format. In the summer of 1942, German forces resumed their attack on the Eastern Front. This time concentrating exclusively on the southern sector, with the objective of conquering Stalingrad and the Caucasus. 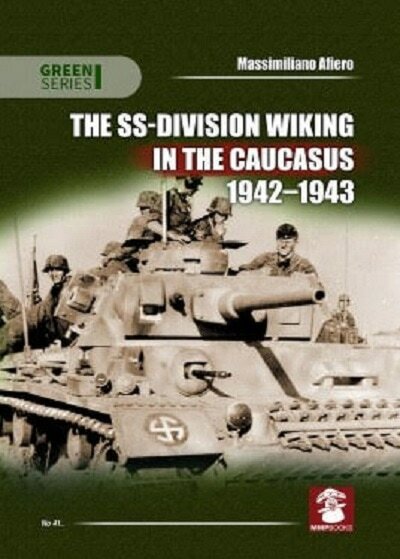 After havine been engaged in the capture of Rostov, the Wiking Division penetrated deeply into the Caucasus, crossing many rivers that criss-crossed that area. Facing thousands of ambushes and thousands of encounters against an enemy that was increasingly battle-tested, tough and impossible to pin down. Throughout this new campaign there lacked, in fact, the sweeping maneuvers of annihilation of the Soviet forces that had characterized the 1941 summer campaign. This time, the Soviet commands and soldiers learned to withdraw and regroup their forces in order to launch ferocious counterattacks, adding skill to their courage. Despite everything, the SS troops were able to reach the far-off Asiatic regions, threatening to reach the shores of the Caspian Sea. The terrain conditions, the strong enemy resistance, logistics problems and heavy losses slowed down the ambitions of the SS and of all the German forces. With the deterioration of the situation on the Stalingrad front, the German forces in the Caucasus were forced to withdraw rapidly to avoid being trapped themselves and it was only due to the stoic stand made by Von Paulus' German forces that enabled them to save themselves, given them time to pull back to the north and return to the positions they had occupied the previous year. The Wiking Division was involved in a terrible winter retreat, characterized by bitter fighting against the enemy and against glacial cold, suffering additional heavy losses, managing to pull the survivors of that terrible adventure across the Mius river. The chronology of events is told in this book through direct testimony of the participants, period war reports and original document. All accompanied as always by and exceptions host of images, maps and documents taken from military archives throughout the world and from highly respected privat archives, all designed to make treatment of the subject more compelling. There are 331 black and white wartime photos in the book and 17 battle maps. There are no color illustrations. The majority of the photos are of soldiers in the fields and portraits of individuals. This book will be of great interest to military historians and modelers alike. I want to thank Roger Wallsgrove, Editor-in-chief of Mushroom Model Publications (MMP) and Casemate Publishing for this review sample. Casemate is the U.S. distributor of MMP books.